SPRING/WINTER 2019 INFORMATION: NEW RULES FOR PONY LEAGUE. AGE CUTOFF FOR SPRING/ WINTER 2019 AUG 31ST FOR BASEBALL JAN 1 FOR SOFTBALL. PITCHING RULES: A PITCH COUNT HAS BEEN IMPLEMENTED FOR BASEBALL 8U PLAYER PITCH THRU 18U PALIMINO. PITCH COUNT FORM CAN BE DOWNLOADED ITS LISTED UNDER RULES AND PRINTABLE FORMS. NEW BAT STANDARDS WILL ARE IN EFFECT USA BATS OR WOOD BBCORR-3. LOOK UP LIMITS FOR PITCHERS IN PONY RULE BOOK ALSO THEY ARE LISTED ON THE PITCH COUNT FORM. NEW BAT INFORMATION!!!! EFFECTIVE SPRING 2018 T-BALL BATS ARE NOW AUTHORIZED FOR USE IN 6U SHETLAND CAN ONLY BE USED WITH A SAFETY BALL. A USA BAT STAMP IS REQUIRED. NEW BATS WILL COME WITH THE STANDARD ALREADY PRINTED ON THEM. STICKERS ARE AVAILABLE FROM LEAGUE TO PLACE ON EXISTING T-BALL BATS ALREADY IN USE FOR A $2.00 FEE. STICKERS ONLY APPLY TO T-BALL BATS. 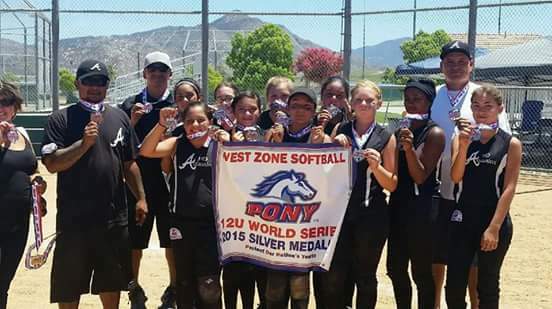 The 12U Assassains capture World Series Silver World Series Banner at 2015 All Star Tournament. 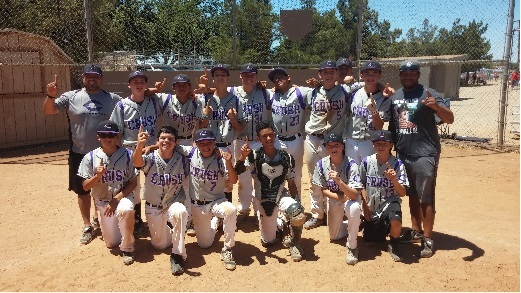 On Sunday 05/31/2015, the U14 Crush finished off their perfect 20-0 season in style by throwing a no hitter in their first game and then throwing a 1 hitter in their second game, winning each by the score of 11-0. If you would like to join our league next season, sign up or contact us to find out more information. Feel free to send text! MANAGERS: Please Report Scores to bossman@ucla.edu - When reporting scores please include the age division, the date and the score (if the game was one by forfeit please indicate that it was a forfeit). Click on LEAGUE REGISTRATION at the top left. Select schedule that you would like to view. Standings are also available there. If you would like to view only your team schedule click on the name of your team.